Farsang is the Hungarian version of Carnival or Mardi Gras, and for kids it is a great time of dressing up and having a party - kind of like Halloween in America, just without all the candy and threatening neighbors that you will play a trick on them if they don't give you a treat. Nate loves Farsang, and last year he had a great time at his óvoda performance. This year parents were not invited, but the kids still had a party at school. 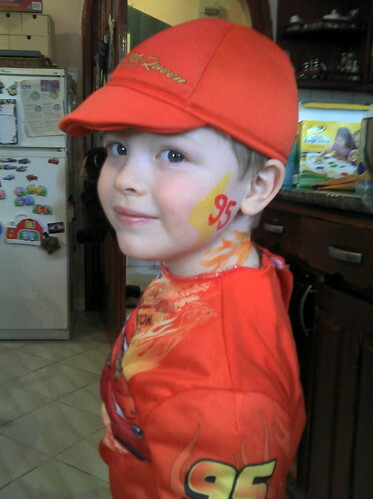 Nate dressed up as Lightning McQueen, and Rosemary did a great job fixing him up with some face paint. Here are some pictures the teachers took at óvoda - they had a full Hungarian folk band!